Where is Baroness Chakrabarti? Anybody seen or heard from her since she took the ermine? If you bump into her anywhere, could you please tell her that she urgently needs to re-open her whitewash inquiry into anti-Semitism (“and other forms of racism”) in the Labour Party, because there’s quite a bit of it on display at the party’s conference in Liverpool. Is she in Knotty Ash? Anybody know? “I’m Jewish and I’m very strongly Jewish, and I make no bones about it, and there’s no doubt in my mind that Jeremy himself is very lukewarm on this subject, he’s never been as vociferous in condemning anti-Semitism as he should be, and when he does make a mention of it he combines it with other forms of racism, so he will never say specifically as far as anti-Semitism is concerned. Ah, there’s that “any form of racism” again. That is very clear. The moment you qualify anti-Semitism with “other forms of racism”, you’re denying there’s any specific problem with Semites (ie Jews) at all. Is it anti-Semitic to disbelieve that anti-Semitism might be a specific problem? What the Labour leader appears to be saying, on reflection, is that holding “violent anti-Israel views” and being “hostile to Jews” are some of the diverse (legitimate?) views on the Middle East within his party, and these are worthy of reflection. Hostility to Jews may be anti-Semitic (or another form of racism), but holding anti-Israel views may be reasoned, if not enlightened, provided they’re not so strongly held as to incite physical violence. Presumably. 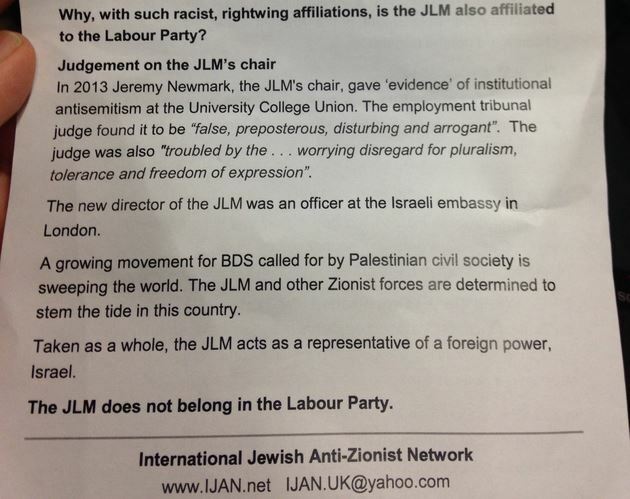 Which brings us to the leaflet being handed out at Momentum’s anti-Semitism meeting. 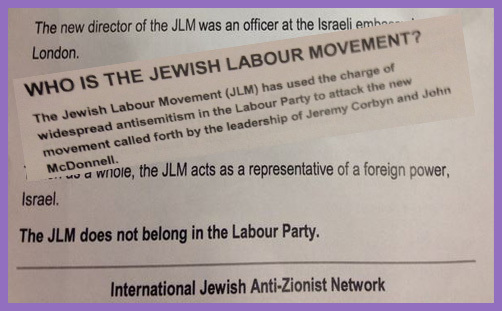 Yes, incredibly, approval was granted for this anti-Semitic propaganda to be distributed at a meeting to challenge assertions/perceptions that Labour has a problem with anti-Semitism. According to the College of Policing ‘Hate Crime Operational Guidance‘ (p37), to accuse British Jews of being more loyal to Israel than they are to the UK is indeed anti-Semitic. If the Jewish Labour Movement does not belong in the Labour Party, where does that leave Jews? “‘Oh, it was just one person’, or ‘it’s just some mad person’, or whatever. There are no excuses for anti-Semitism at all and frankly the moment you engage in that excuse you are on a slippery slope to anti-Semitism yourself and you should be ashamed. “In order to get beyond racism,” Justice Harry Blackmun once wrote, “we must first take account of race. There is no other way.” So Labour must take account of Jews in its policies and pronouncements, lest anti-Semitic prejudice and discrimination infect its whole political discourse. If a preferential report on Labour’s treatment of and attitude toward Jews was not justified (“and other forms of racism”), then how can any policy which prefers any minority be reasonably advocated? There may be moral disagreement over lists and quotas to ensure gender and ethnic diversity, but a party which believes such mechanisms to be necessary to ensure fair representation must find a compelling reason to violate the principle of equal consideration for Jews. There is none, of course. Democracy feeds off robust disagreement: moral conflict is an imperative in reasoned deliberation, and political parties are nothing but coalitions of factions with competing interests. But forget Old Labour vs New Labour, or Blairite-Tories vs Militant, or Clause 4 vs Third Way. Anti-Semitism has become Labour’s deepest fault-line and most serious division, because it is the oldest hate crime of all. Momentum, under the aegis of Jeremy Corbyn, aided, abetted and dignified by Baroness Chakrabarti, deny there’s any problem with anti-Semitism at all, while hosting a meeting on anti-Semitism at which leaflets are distributed which advocate the expulsion of Jews from the Labour movement. Chris Bryant, recognising that there is indeed a growing problem with certain anti-Semitic members, demands that the anti-Semites get out of his party – presumably voluntarily, because, according to Baroness Chakrabarti, there is no substantial evidence to justify their expulsion. Who wins, of course, depends on who blinks first and who spins best.